Paul Scherrer Institute - Swiss FEL light source: small is beautiful! The next large scale facility in preparation at the Paul Scherrer Institute (PSI) is an X-ray free electron laser, named the SwissFEL. This national project aims to provide one of the world’s most brilliant light beams by the time it will go in operation in 2016. The magnetic components for SwissFEL, namely the bending magnets, focusing magnets and undulators are very challenging because of the small size of the magnet apertures, and the severe tolerance requirements on quality of the magnetic field. Let’s take a guided tour with Stéphane Sanfilippo, the leader of the PSI Magnet Section, and find out more about mobile Hall probes, miniature rotating coils and stretched wires used for SwissFEL. The free electron laser in preparation at the Paul Scherrer Institute (Villigen, Switzerland) aims to provide a source of extremely brilliant and short X–ray pulses, covering the wavelength rangeThe range of a probe is defined by the minimum and maximum field strength it can measure. On an instrument,... 1 Å to 70 Å using a compact (about 700 m long including the experimental hall) and economic design, affordable on a scale of a national laboratory. This facility will allow the study of ultrafast phenomena (<20 fs) at the nanometer length-scale in complex materials, opening up unprecedented opportunities for understanding catalytic reactions, analyzing ultrafast magnetic phenomena or even biomedical research. The flagship project of the Paul Scherrer Institute is planned to be operational by 2016. Magnetic issues are one of the important concerns: hundreds of magnetic elements (solenoids, quadrupoles, dipoles, steerers and undulators) will be positioned in the electron acceleratorParticle accelerators were developed by physicists to study the elementary nature of matter. Nowadays, they are usually immense, highly international... (injector, linacs) and in the two X-ray free electron laser beam lines. The magnets are designed to guide and focus the beam, and the undulators will drive the FEL lasing process. Room temperature magnets and undulators made with permanent magnetA magnet using the magnetism "locked into" the structure of a suitable material rather than a current in a coil.... technology will be used. “Designing and measuring them is very challenging, because of the small size of the quadrupoleIn accelerators, a magnet with four poles, yielding a highly inhomogeneous magnetic field. See focusing magnet and multipole magnet.... apertures (down to 10 mm diameter) and the required tolerance on the field quality and magnetic alignment,” points out Dr Stéphane Sanfilippo, the leader of the PSI Magnet Section. The construction and measurement of the magnets for the injector module, completed in 2010, was a milestone for the feasibility of the entire project. A series of 45 mm diameter quadrupoles with a field gradientIn this context, gradient refers to the spatial variation of the magnetic field.... of 25 T/m, various dipoles with magnetic fields ranging from 0.2 to 0.4 T, and solenoids with magnetic fields ranging from 0.1 to 0.35 T were built and measured. The following tight specifications had to be fulfilled for the magnets delivered for the injector: integrated field strength accurate to 10-4, quadrupoleIn accelerators, a magnet with four poles, yielding a highly inhomogeneous magnetic field. See focusing magnet and multipole magnet.... harmonic field quality accurate to 10-3, solenoidA magnet in the form of a cylindrical coil, concentrating the field inside the cylinder. See Bore.... magnetic axis accurate to 0.1 mm. The integrated field strength, the magnetic field maps and the magnetic axis were measured with mobile Hall probes traveling along the axis of the magnets (dipole, solenoids, and quadrupoles). The Hall probeThe actual sensor that is placed in the magnetic field. The NMR probe contains the NMR sample; the Hall probe... magnetic measurement system, developed by the PSI, ensured the determination of the magnetic field with an accuracyAccuracy is how close a measure conforms to reality. Even if our NMR Teslameter displays 9 digits, we claim 5... of 0.1 GaussThe cgs unit of magnetic flux density. Officially declared to be outdated, it is still popular for low fields. Equal.... The harmonic field quality of quadrupoles was measured by a fluxThe magnetic flux density, B, integrated over an area. The voltage induced in a coil is proportional to the flux... integrating probeThe actual sensor that is placed in the magnetic field. The NMR probe contains the NMR sample; the Hall probe... (mole) constructed by CERN (Geneva, Switzerland), and purchased by Paul Scherrer Institute in January 2010. The 750 mm long mole has an outside diameter of 41 mm and consists of 5 coils, mounted side by side, allowing accurate harmonic measurements thanks to dipole and quadrupoleIn accelerators, a magnet with four poles, yielding a highly inhomogeneous magnetic field. See focusing magnet and multipole magnet.... compensation. The reproducibility of the system was about 10-4 for the main field and at the level of ppm’s for the harmonics at 17 mm. Let us finish by taking a look at an essential componentThe magnetic field is a three-dimensional vector quantity, with three components. 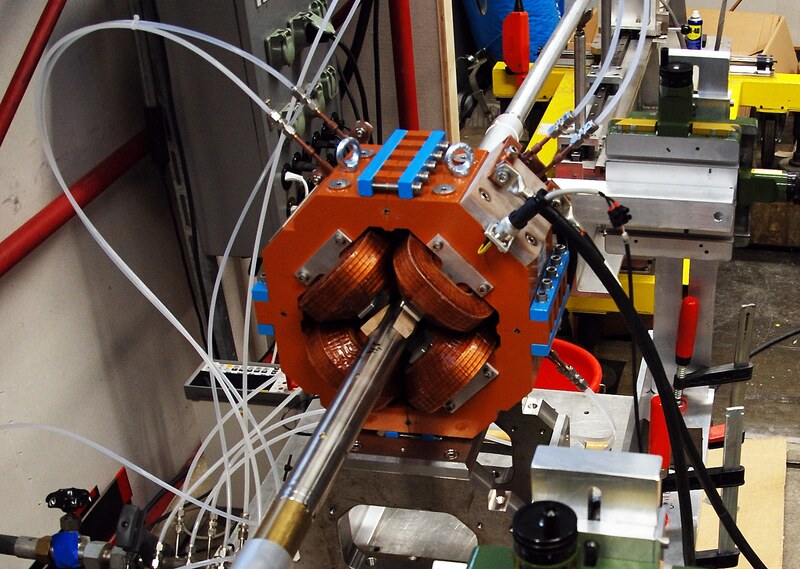 Magnetometers may measure 1, 2 or 3 components, or... for the Swiss FEL: the undulators. They generate a sinusoidal magnetic field with high peak intensity and short period, using permanent magnets of alternating polarity. The electrons “wiggle” back and forth and the transverse acceleration causes the emission of radiation at each polePart of a magnet used to focus the flux in a gap. The pole face is the interior surface of.... Designed under the guidance of Dr Thomas Schmidt, the 12 4m–long undulators will consist of 25000 neodymium-iron-boron permanent magnets, each with a remanent field of 1.25 T. The bar has been set very high: the trajectory has to be straight within 1μm and the gapThe area between the two poles of a dipole magnet, where the magnetic field is concentrated. Also used to refer... accuracyAccuracy is how close a measure conforms to reality. Even if our NMR Teslameter displays 9 digits, we claim 5... has to be kept at 0.01%. The magnetic measurement strategy is based not only on Hall probeThe actual sensor that is placed in the magnetic field. The NMR probe contains the NMR sample; the Hall probe... measurements but also on various “stretched wire” techniques (pulsed, vibrating). A single conducting wire, stretched through the magnetic structure and moved by precisionPrecision is how closely multiple measurements will be clustered. Also called reproducibility or repeatability. In everyday speech, often confused with... translation stages at both ends, translates magnetic field variations into measurable voltage. “The use of the vibrating wireA mapping technique similar to pulsed wire, used to create a longitudinal map of accelerator magnets. An AC current, at varying... technique in undulators and quadrupoles will enable us to measure the position of the magnetic axis with an exceptional sensitivity,” sums up Stéphane Sanfilippo. Nothing could be simpler!